Rubotherm is specialized in analytical instrumentation for sorption measurements, measuring of thermo physical properties and thermogravimetry as well as laboratory plants for process study and optimisation. R&D expertise is offered in design, engineering and automation of high-end analytical equipment, hard- and software engineering for process automation, chemical engineering and chemistry. An application laboratory providing measuring and testing facilities is available. Besides its standard product range Rubotherm offers especially engineered instruments and laboratory testing facilities, some of them using also the technology of our magnetic suspension balances. For instance multi-bed PSA and TSA adsorption pilot plant for breakthrough curve measurement of complex mixtures, cycling instruments for testing the durability of adsorbent materials, and fixed bed reactors for testing of catalysts under process conditions have been realized, to name a few. We are experienced in European and national funding programmes. In Situ Sensor development for fast and combined Inline measuring of process streams properties and concentration analysis of gas mixtures in a wide temperature and pressure range: density, velocity of sound, thermal conductivity, impedance, IR-UV/VIS, FTIR, Raman. Mixture modelling for measured properties of process streams, e.g. concentration analysis. Combination of different property sensors for generating of process analysis data. Process control Software and Hardware: Hardware standard automation tools and customized solutions by integration of MC and embedded PC, New process oriented real time Framework for development of standalone equipment with interface, Platform independent automation software including open hardware I/O interfaces e.g. Modbus, Profibus, Profinet etc., real time data logging with digital certificate stamp for each data point - high data traceability and security, visualization, process monitoring, control and data management via WebGUI from anywhere. o	Gas/solid equilibria in pure fluids as well as in complex mixtures using a magnetic suspension balance to measure sorption/desorption isotherms, sorptive gas densities and sorbent swelling. Gravimetric instruments with magnetic suspension balance for sorption measurements at high pressures (up to 700 bar) and low to moderate temperatures (-196°C…400°C). IsoSORP instruments are widely applied for isothermal measuring equilibrium and kinetics of ad- or absorption processes. Research applications covered are shale gas, adsorption isotherms and kinetics, gas storage processes, diffusivity and permeability measurements, gas solubility in polymers and liquids, selective sorption processes, supercritical fluids, separations, sequestration. Gravimetric instruments with magnetic suspension balance for thermogravimetric measurements at high temperature (up to 1600°C) and high pressures (up to 350 bar). DynTHERM instruments are applied for challenging thermogravimetric measurements involving corrosive, toxic or explosive measuring atmospheres, vapors and high pressures. Typical research applications are coal & biomass gasification, pyrolysis, catalyst testing & coke deposition studies, high temperature corrosion, metal dusting, CVD processes, chemical looping, enhanced oil recovery. Gas & vapor dosing, mixing and pressure control devices for feeding external reactors or instruments with measuring atmospheres at exactly defined composition and pressure. The FlexiDOSE is the perfect completion for the IsoSORP and DynTHERM instruments. The automatically operated FlexiDOSE devices can generate gas and/or vapor mixtures with controlled composition and regulate the pressure of the atmosphere extremely stable and accurate. Besides the combination with the balance instruments the FlexiDOSE devices are the ideal tool for researchers searching for an automatic device to operate reactor systems or laboratory processes. The FlexiDOSE instruments are fully automatic operated by PC control. Its standard gas connections allow easy combination and integration with existing autoclaves or reactors. Gravimetric instruments for measuring thermodynamic properties in a wide pressure and temperature range and exact knowledge of thermodynamic or thermophysical properties are a key requirement for instance for improving the efficiency of energy conversion and storage processes. FluiPROP instruments are applied for gas permeability measurements – calibration of so-called permeation tubes – vapor pressure measurement with Knudsen-cell and fluid density measurements of liquids and gases. Non-Gravimetric multisampling instruments for gas adsorption measurements. In order to reduce the time required to characterize materials, Rubotherm has developed the quick test instrument InfraSORP for ultra-fast adsorption capacity evaluation in quality control and material science. 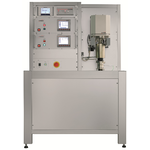 NG-Series instruments are applied for characterization of porous materials (BET surface area, pore size distribution) and catalysts (TPD, metal dispersion) in quality control and research as well as multisampling gas adsorption measurements in medium pressure ranges up to 50 bar in chemical engineering and material science. Autoclaves for high pressure and high temperature applications. MaxiCLAVE autoclaves are covering an extremely wide range of temperature and pressure conditions. 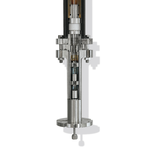 Applications of the MaxiCLAVE reactors are wide; amongst others for instance multi-reactor setups for PSA and TSA processes or installations for gas solubility measurements have been realized. The reactors can be designed in a corrosion resistant version allowing for long term corrosion studies and catalyst coke deposition measurements.